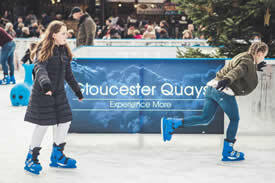 The Christmas Ice Rinks team have been providing our public and private sector clients with world-class temporary real ice rinks which attract visitors and encourage spending in the wider community for over 13 years. If you’re considering a real ice rink for your prime location this Christmas or at any time of year, what do you need to know about how it works? Installing a temporary real ice rink begins weeks before the work starts. You’ll be assigned a project manager who, working with you, will do all the necessary ground work needed to provide a firm quote for our service as quickly as possible when s/he has all the information they require. Your project manager stays with you right from the quote stage through the installation to the operation and the final dismantling. How can you get the most ice rink for the space you have available while, at the same time, maximising revenue opportunities, encouraging participation, and ensuring that visitors and staff can operate in an environment with the highest health and safety standards? During the quotation process, we’ll provide you with detailed plans and proposals for you and other decision makers within your organisation to consider. In addition to the ice rink, you can, at the same time, decide on other structures and features you want – speak to our team to find out what we can offer. Part of the consideration behind the size of the Christmas ice rink we install for you is based on the state of the ground in your prime location. We will always install a levelling sub-based to provide a flat, non-sloping surface for the most enjoyable and predictable user experience. Every client has their own ideas about providing customers and visitors with the perfect skating experience. Let us know what you have in mind and, if we can’t organise it ourselves, we’re certain to know a trusted and qualified supplier we can recommend and, if necessary with your prior approval, sub-contract. We will need access to water and other utilities when we’re on site. If you put us in touch with your current supplier, we can take care of all the necessary arrangements with your permission. We can provide as much or as little support to all aspects of running your Christmas ice rink from ticketing to marketing to sponsorship to security. Our service is completely flexible and we can provide staffing and support to the level required. When the ice rink is closed, we maintain the surface of your rink using either motorised re-surfacers or snow scrapers, depending on the size of your installation. At the end of the hire period, our experienced construction team will dismantle all of the structures used in your temporary real ice rink hire installation making sure that the area is left as we found it prior to putting up your rink. To find out more on how we’d install your rink and the other options on offer, call or email Christmas Ice Rinks as soon as you can.